Arts leaders have created a non-profit to renovate the downtown movie house in Atchison, Kansas. But as the downtown declined, so did its theater. Small-town movie houses nationwide have been struggling as populations decline and running a theater becomes more expensive. But some are finding a way to make a go of it. In Atchison, a story on the radio connected two small theaters in two small towns. Today, The Royal, located midway along the quiet outdoor walking mall downtown, is mothballed. The marqee hangs between the Atchison County Health Department and a pizza parlor. Vacant storefronts dot the covered walkway. The arched ticket window is flanked by two entry doors. The dusty glass covered from the inside by hanging burgundy drapes. Hard mud wasps nests are lodged in the corners of “Now Playing” posters that advertise the last Alvin and the Chipmunks. But inside, work is going on. Travis Grossman is executive director of Theater Atchison, the town's live performing theater. He explains the non-profit recently purchased the movie house and is engaged in a multi-million dollar renovation. "You can see the footprint of where the concession was, the old tile, and there’s the old box office," he says, walking over to the rounded window of the ticket booth. Grossman has been part of efforts to save The Royal for years. But the financial risks facing the movie industry scared investors. The digital technology, for example: tens of thousands of dollars. Many large companies have new licensing and marketing strategies that require at least a six-week run. In a small town, there aren't enough people to make that profitable. "Everyone sees it in the first two (weeks) and then, it’s crickets for the last four," Grossman says. And to even get folks out for an "in-theater" experience, the movie house needs more than just popcorn and candy. People want plush reclining seats. Without making the movie-going experience special, he says, people will stay home and watch Netflix. For all these reasons, investors are reluctant to put money into movie houses in places like Atchison. "You can see the work that needs to be done. It just didn’t pencil out," he says. "We couldn’t sell enough tickets to service the debt it was going to create." Then they got a call out of the blue from Bob Leeper. Leeper grew up in El Dorado Springs, Missouri, about 160 miles southeast of Atchison. Leeper now lives in Stanley, Kansas and heard some reporting KCUR did on Atchison. 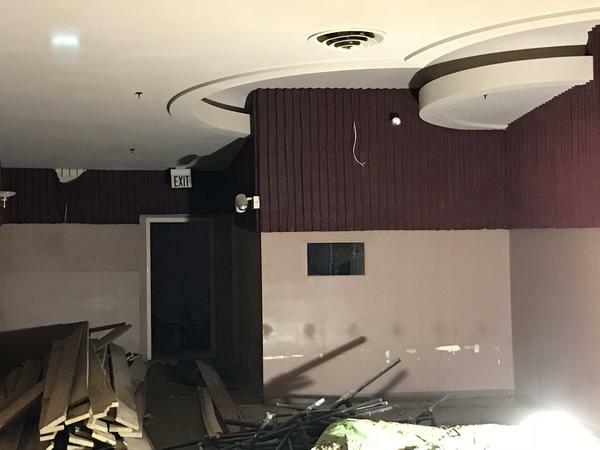 The city’s economic development director said on KCUR's Central Standard that revitalizing the downtown relied on renovating the old movie theater. And he shared how hard it had been to get funding. This struck a chord with Leeper. "I knew there were people from my home town, El Dorado Springs, Missouri, who had similar problems trying to get their movie theater activated," he says. Leeper says they succeeded by starting a non-profit community organization. Today, The Opera House Theater in El Dorado Springs is run by a volunteer arts council. The one -creen movie house can bring in new releases and show them for just one week if they wait until they’ve had some time in bigger markets. Coming next to El Dorado Srings - Jurassic World: Fallen Kingdom, Mamma Mia and Christopher Robin. "Basically all I did was I connected two people who were about 150 miles apart but both with the same interest," Leeper says. The demise of small-town movie houses pose a risk, says Jim Amos in Forbes Magazine, to the fabric of small-town life. As a recent guest on KCUR's Central Standard, Amos said he recognized the role of the local theater when he worked for one. "Every Friday and Saturday night you’d see the same people coming through the doors," he said. "They'd stand and talk in the lobby before the movie would start." "Then they'd stand and talk to their neighbors after the movie was over. They had that interaction with the people in their community." Amos said he found many small-market theaters under the same economic pressure El Dorado and Atchison are feeling. Which makes it hard to offer tickets at an affordable price. When Grossman got word how well El Dorado Springs movie theater was working, he was game to try it in Atchison. Grossman immediatly got to work with donors in town and created a non-profit. Today, Theater Atchison and what will be The Fox Theater are one company. Donations toward the renovation have exceeded $1.5 million, Grossman says. The three-screen, state-of-the-art movie house will be open by Christmas, Grossman hopes. If that's too ambitions, he says for sure by spring, when Disney is slated to release its remake of the movie Dumbo.